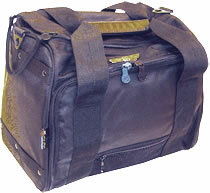 The Gemini Flight Bag is a fully padded duffel designed to protect the pilot's important gear. The Sky High Gemini Flight Bag is made with full sized compartment flaps, allowing easy organization of flight materials and access during flight - there is even a special stow-a-way pocket designed to hold most kneeboards. Everything is right where it should be - especially important during IFR flights. The center compartment has a double zipper opening with a padded quad-modular divider to segment the compartment for custom organization and easy access. Dimensions: 14.5" x 11" x 9.5"
If you would like to compare all products made by this manufacturer, please refer to our Sky High Flight Bags Comparison Chart. The AVCOMM Deluxe Double Headset Flight Bag has seven compartments with shock resistant padding. Inside partitions and closures secure radios and gear. Outside features compartments, zippered pockets and pouches for headsets and more! Free Shipping! The B7 FLIGHT ECHO is perhaps the most useful flight bag ever designed. Some days you need more gear than others. The B7 lets you carry a full set of flight gear and then it lets you downsize to a smaller bag when necessary.